BARCELONA, SPAIN - Spanish broadcaster betevé has invested in Solid State Logic's System T broadcast audio production environment, with two System T S300 32-fader consoles being deployed in its main TV studios 1 and 2 (news and general production). The whole system was specified and supplied by SSL Spanish partner Zentralmedia. betevé is the local, publicly-owned broadcaster serving the metropolitan area of Barcelona with TV channels, radio, and on line. It began broadcasting in 1994 and has a reputation as a progressive broadcaster, in strategy, in content, and in technology. 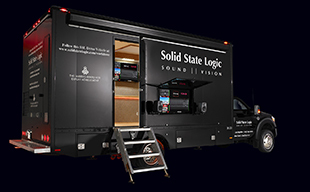 The station's latest jump forward has been the installation of Solid State Logic's System T into studios 1 and 2 at the betevé TV facilities, all connected via a redundant Dante Audio over IP network. Commenting on the choice, Jordi Colom, Director tècnic i d'innovació (Technical and Innovation Director), explains: "First, we chose System T for its audio quality. We wanted an AoIP system that was easy to manage - so it could be run by audio engineers, not system engineers. "The initial installation and set-up was quick and easy, and now we can change from one studio setup to the next one in a matter of seconds." Studio 1 (news) will be broadcasting general news programmes and interview features; the general production studio content ranges from Sports and culture panels to live music shows. Each control room has a System T S300 32-fader control surface and an SSL Network I/O A16.D16 (analogue and digital I/O to network). We wanted an AoIP system that was easy to manage - so it could be run by audio engineers, not system engineers. Jordi Colom. There are two System T T25 Tempest Audio Engines in the machine room, each capable of processing up to 256 fully processed paths at 48kHz. Two Network I/O: MADI-Bridge units take care of connecting the new networked system to existing MADI infrastructure at the studio. Stage 1 at betevé has a mobile stagebox with an SSL SB32.24 stagebox (32 mic/line inputs, 16 analogue line outputs, 8 digital inputs, dual redundant Dante connections), while Studio 2 has two SSL SB8.8 stageboxes (eight analogue in and out, dual redundant Dante connections each). The whole system uses a redundant Dante (AES67, SMPTE 2110) AoIP network to connect everything everywhere, for ultimate flexibility across both TV stages. This employs COTS (Common Off-The-Shelf) network hardware, such as Cisco network switches and Cat6/fibre connectivity, for high-capacity audio routing, instead of costly, product-specific TDM routing systems. The SSL System T S300 32-fader control surface was launched recently at NAB in the US and at IBC in Europe. It's a fixed layout control surface in 16+1 and now 32+1 fader versions that can be combined with any System T network objects (control, Network I/O, and processing engines), as part of a larger installation, or in stand-alone configurations for smaller broadcast facilities or OB. It also includes fully integrated, arbitrated audio and control resource sharing for SSL’s Network I/O range across SSL’s Tempest platform-based consoles: S500, S300, TCR, and SSL Live (L500 Plus, L300 and L200).